Advanced RISC machines has announced that the 10 billionth ARM-based chip has been shipped. And with the company's chips now powering everything from the iPod and iPhone to your TomTom, the Nintendo DS and your Netgear router, you'd be forgiven for thinking that Cambridge-based ARM has always been on the bigger stage. But this global player has a somewhat romantic British heritage. Once part of educational computer supplier Acorn where it played ahead of its time, ARM used its first ARM1 chips as part of a BBC Micro-based development kit for the 32-bit Acorn Archimedes, the second-generation of school computers after the original Micro. The A3000 carried the BBC moniker into the WIMP age. "From its beginning the ARM CPU was small and efficient. It was clearly a CPU ahead of its time," explains Tony Massimini, chief of technology at Semico Research. "It took a lot of hard work and dedication to find the right home for ARM technology. Before Windows wedged Acorn on the rocks, ARM was spun-off and developed its first embedded RISC (Reduced Instruction Set Computer) core, the ARM6, in 1991. But during Acorn's educational heyday, Acorn started to talk to those crazy guys at Apple. The work later found its way into the cult Apple Newton, which used the ARM 610 processor. The relationship continues, underpinning the iPod and iPhone. Crucially ARM doesn't actually manufacture chips itself - it licenses its technology. "ARM deserves congratulations for successfully executing the business model of licensing microprocessor technology as intellectual property," said Tom R. Halfhill, senior analyst for In-Stat's Microprocessor Report newsletter. ARM was an early pioneer of this revolutionary business model, and it has given ARM a long reach." 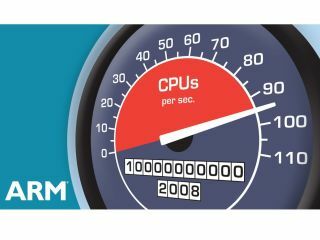 ARM says its partners currently ship almost three billion ARM-powered processors each year. "At this rate, within a year we will find that every man, woman, and child on this planet will have the use of an average of two ARM processors - and a lot of cool electronic devices too," says Tom Starnes of analyst Objective Analysis. Other kit that uses ARM processors include the LG Viewty, Nokia N95 and Sony Ericsson P1i smart phones as well as Garmin and Navaman satnav units, Toshiba digital televisions, hard disk drives from Samsung and Seagate, and automotive braking systems from Bosch.